’19 CORVETTE ZR1: IT’S GOOD TO BE KING! America’s sports car morphs into a contender for international Supercar honors. 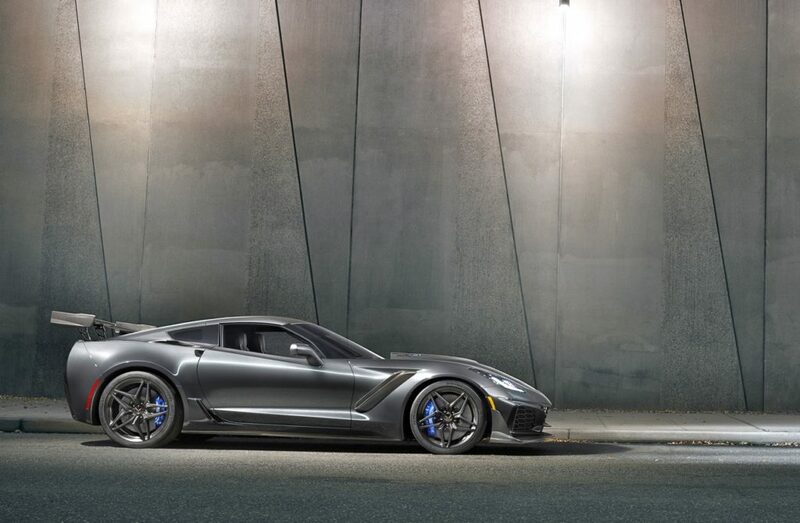 In Dubai, United Arab Emirates, today, Chevrolet introduced the ‘19 Corvette ZR1, a supercar that boosts Corvette’s performance heritage with the highest power, greatest track performance and most advanced technology in its production history. The Corvette ZR1’s exclusive LT5 supercharged engine, rated at an SAE-certified 755 horsepower and 715 pound-feet of torque, is establishing a new performance benchmark. Further, the ZR1 elevates Corvette’s track capability with two wind-tunnel-honed aerodynamics packages, including an available High Wing that provides an estimated 950 pounds of downforce. The ZR1’s LT5 6.2L V-8 advances Corvette’s supercharging legacy, which began with the 2009 sixth-generation ZR1 and continued with the 2015 seventh-generation Z06. The LT5 delivers the highest output ever for a Chevrolet production vehicle, thanks in part to a new, more-efficient intercooled supercharger system that offers 52 percent more displacement than the Z06’s LT4 supercharger. GM’s first dual-fuel-injection system, which employs primary direct injection and supplemental port injection, helps the LT5 achieve its record output. Seven-speed manual and eight-speed paddle-shift automatic transmissions are available with the LT5. It’s the first time an automatic transmission has been offered in a ZR1. The ‘19 Corvette ZR1’s aggressive appearance is driven by function, contributing to its distinction as the fastest production Corvette to date. An all-new front fascia is designed to channel air for propulsion-system and drivetrain cooling, with four new radiators bringing the heat-exchanger total to 13. A special carbon-fiber “halo” hood is open in the middle to clear the LT5’s supercharger/intercooler assembly. 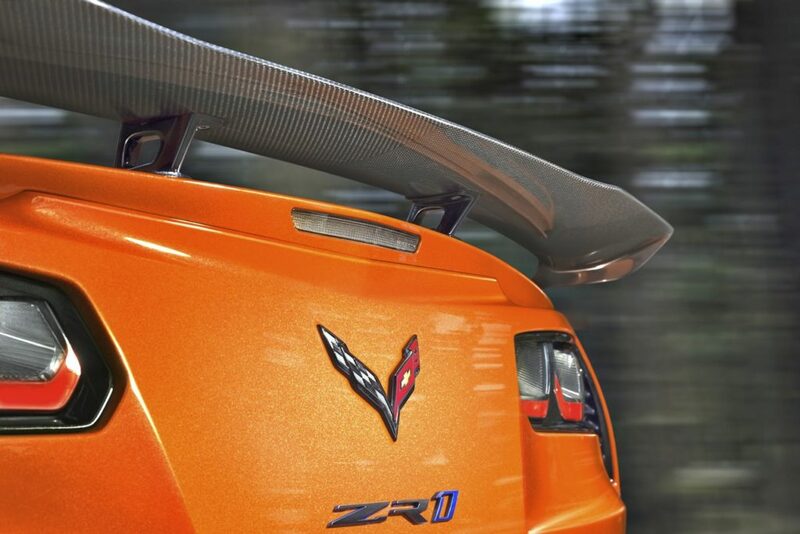 Additional features, including aero packages with stanchion-mounted wings, help push the ZR1 harder onto the track for more confident handling and faster lap times. Top speed of the ZR1 is over 210 mph. The ZR1 will offer two aero packages: a standard rear Low Wing, which delivers the highest top speed and helps generate up to 70 percent more downforce than the Z06’s base aero package. There’s also an available two-way-adjustable High Wing that offers maximum downforce on the track for the quickest lap times – about 60 percent more downforce than the Z06 with the available Z07 Performance Package. All models also feature a Chevrolet-first, downforce-enhancing front underwing. The adjustable High Wing is part of the new ZTK Performance Package, which also includes a front splitter with carbon-fiber end caps, Michelin Pilot Sport Cup 2 summer-only tires, and specific chassis and Magnetic Ride Control tuning for greater cornering grip. 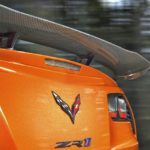 Both of the ZR1’s wings are tied into the chassis, like the Corvette Racing C7.R racecar, for strength and stability. 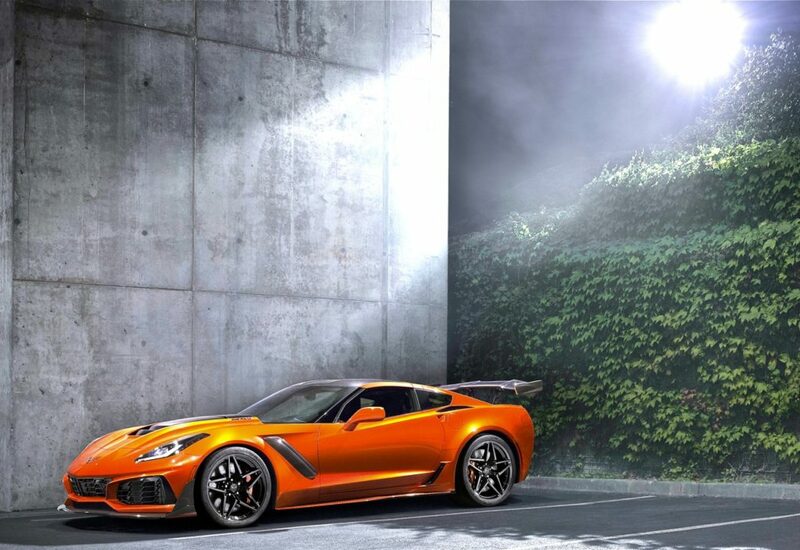 The Corvette ZR1 introduced today also debuted a dynamic, available Sebring Orange Design Package. Centered on its Sebring Orange Tintcoat exterior color, the package also includes orange brake calipers, orange rocker and splitter accent stripes, orange seat belts, orange interior stitching and unique, bronze aluminum interior trim. The new design package complements the Corvette ZR1’s tradition of offering maximum performance with refinement and design distinction. The driver-focused, well-appointed cockpit includes standard leather-trimmed seats, with sueded microfiber inserts offered. Heated and vented Napa leather-trimmed seating is also available, as well as a carbon fiber-rimmed steering wheel, competition sport seats, Performance Data Recorder, Bose premium audio system and more. The ‘19 Corvette ZR1 goes on sale next spring, poised to take on the world’s best. 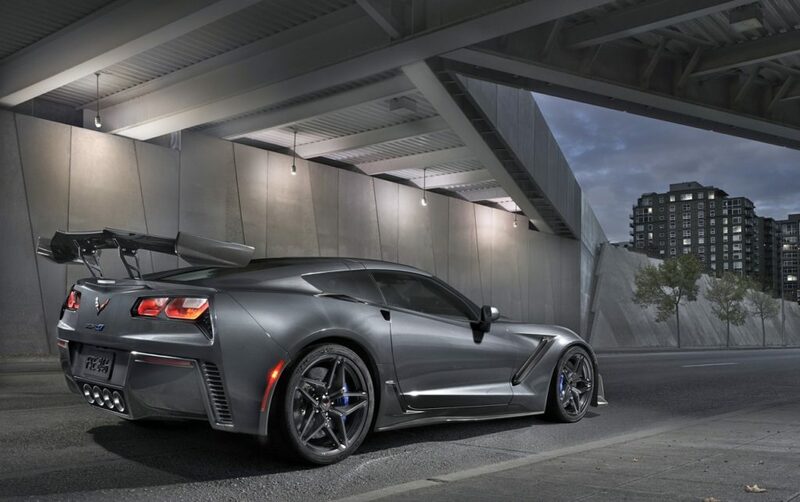 The post ’19 CORVETTE ZR1: IT’S GOOD TO BE KING! appeared first on Car Guy Chronicles.